A variety of culinary traditions produces many types of pastry. What sets them apart is the ingredients, their proportions, and the method used to make them. By definition, pastry is a dough made of flour, salt, fat, and water. 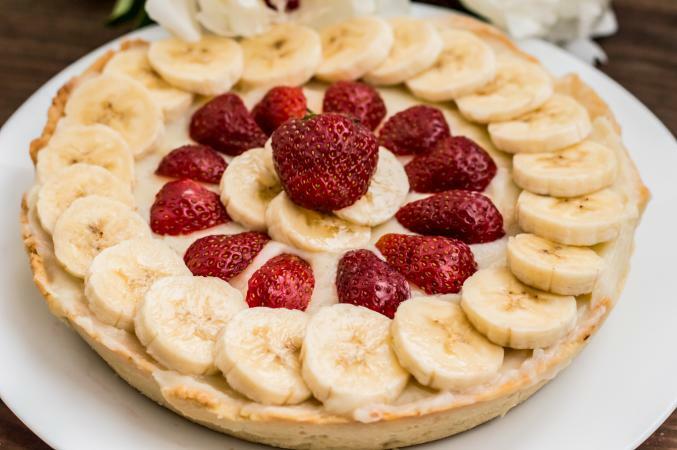 The flour can be all-purpose or pastry flour and the fat can come from animal sources like butter or lard or from vegetable shortening or oil, and the water can be replaced with milk or another liquid. Some versions also call for sugar and eggs. There are several different types of pastry that typically fall into broad categories. 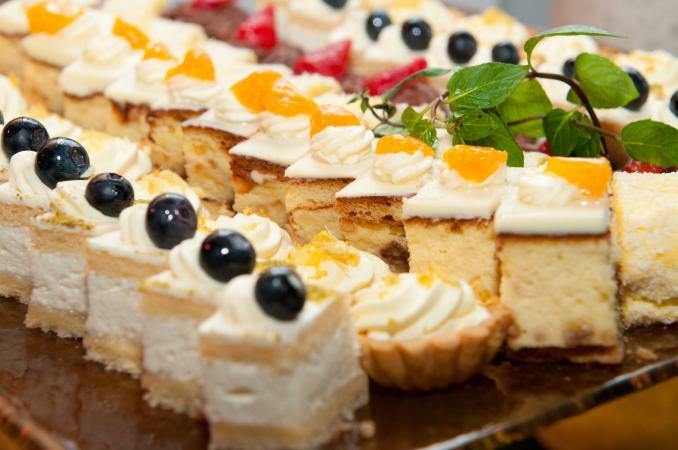 But, in general, five types of pastry are recognized among pastry professionals. This is the most commonly used form of pastry. It is made with flour, salt, fat, and water. The flour is whisked together with the salt and then the fat, in the form of butter, lard, vegetable shortening or oil (or any combination thereof), is cut into the flour until the mixture is pea-sized. Water (or sometimes another liquid like milk) is then used to bring the pastry together. Shortcrust pastry requires minimal handling in order to preserve its flakiness. Excessive handling will cause gluten strands to form and toughen up the dough. Shortcrust pastry is what is used in sweet or savory pies, tarts, and quiche. Once the dough has been made, it typically is covered with plastic wrap and given a short rest. Then it is rolled out on a lightly floured board (only once) and then fitted into the pan, filled and baked. Also known as flaky pastry and blitz puff pastry, rough puff pastry also is made with flour, salt, and fat. It differs from puff pastry (see below) in that lumps of the butter or other fat are mixed into the dough instead of a large rectangle of fat being enveloped in dough. Both types of dough require rolling and folding before shaping. When the rough puff pastry is baked, the fat in the layers melts causing air pockets, which results in a light, flaky pastry. Strudel, turnovers, pasties (meat turnovers) and pot pie crusts are typically made from rough puff pastry. Puff pastry is an extremely light and flaky pastry made with flour, salt, and fat. A butter packet or other solid fat rectangle is placed between two layers of dough which are repeatedly rolled and folded to create many layers before shaping. As the pastry bakes, the fat between the layers of dough melts, and turns into steam that expands the pastry creating an extremely puffy, flaky product. Making puff pastry from scratch can be a daunting task that involves multiple steps over the course of many hours if not a few days. Luckily, there are good-quality brands in flat sheets and squares and round cups available in most grocery stores' refrigerated or frozen section. Puff pastry is the type used to make Beef Wellington, Brie en Croûte, palmiers and other desserts. Croissants also are made from puff pastry modified with the addition of yeast. Phyllo pastry, also known as filo dough, is made with flour, water, and a small amount of oil or white vinegar, and sometimes egg yolks if it will be used in dessert recipes. It is an extremely thin pastry about the thickness of tissue paper. The sheets are layered with melted butter or oil and then filled and baked to create a final dish. 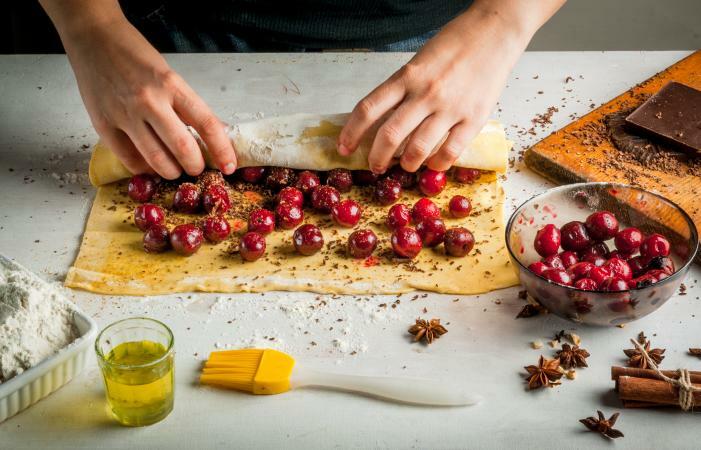 Because phyllo is so thin and delicate, it tears easily and can dry out quickly if not covered with parchment paper and a damp towel while it is being worked with. 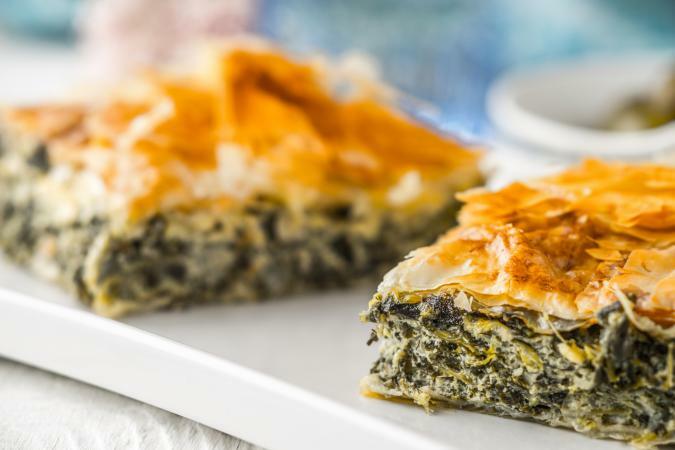 It's a very versatile pastry and is used to make baklava, spanakopita, and many other foods. Like puff pastry, phyllo is fairly difficult to make because it is hard to get the pastry as thin as is required. Fortunately, commercially prepared phyllo pastry is commonly available in the refrigerated or freezer section of many grocery stores. There are a number of sweet and savory recipes that can be made with pâte à choux (also referred to as choux paste). A basic choux paste is made by boiling water and butter, adding flour and then beating eggs into the cooled flour paste until a smooth and shiny dough results. A piping bag is filled with the dough and desired shapes are piped onto sheet pans and baked. The high moisture content in the dough creates steam during the cooking process which puffs up the dough. The cooled pastries are typically filled with pastry cream or sweetened whipped cream. 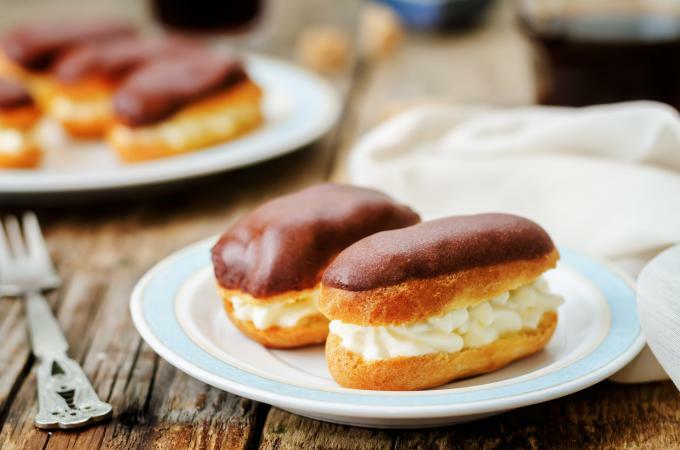 Cream puffs and éclairs are examples of foods made using pâte à choux, but it can also be used for savory puffed appetizers such as shrimp puffs or gougères. Making pastry doughs from scratch requires exact measurements and precise handling in order to turn out well. Luckily, there are commercial products available for purchase that are nearly as good as homemade. 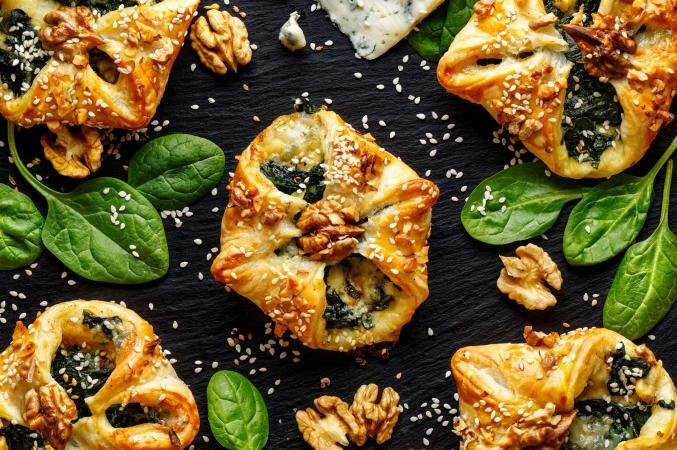 Whether you prepare the five basic types of pastry from scratch or use purchased forms, learning how to work with them will open up a world of culinary possibilities from appetizers to desserts.